Like other kids growing in Peoria-area from the 50's thru late 70's, I was fed daily doses of The Three Stooges, Baby Huey, Roger Ramjet, Hanna-Barbera cartoons. Spiced with tempting commercials of Ideal board games, Red Goose shoes and products from Wham-O, how could anyone under age 10 resist such kiddie carnal pleasures? After hearing a dreary flow of soap opera themes for three hours prior, just hearing the jaunty Jinks theme song you knew there was hope around the corner. Does anyone know of the name or source of the theme song? I heard that it is background music from a movie soundtrack during a 1800's European village scene. Boy scout troops regularly visited the S.S. Albatross at WEEK-TV studios greeted with an "Ahoy matey!" from Salty Sam and entertained by sketch artist Bosum Joe. Rabid fans would send in artwork or jokes to be aired on the show. I had one joke told on air which I proudly created: "What did one ant say to another ant?" "Are you my AUNT?" Must have been a slow letter day for that to be read. But I felt like a king at school the next day. Larry David wishes he had that comedic genius at such a young age! We now pause for this commercial break. Jinks and Salty ranked so high in rugrat royalty they even had their own float in Peoria's Santa Parade. Only Santa topped the excitement of seeng the pair in person. The float is still used in Santa parades. I had the pleasure of meeting Jinks and Salty at Carson Pirie Scots' "Breakfast with Santa" in the mid-1960's. Located on the top floor and conveniently located in toyland kids got to mingle with REAL celebrities. I vividly remember Salty Sam picking me up and carrying me over to meet The Captain. All I could say was "Everything is shipshape Captain!" with a proud sailor salute. I was then plopped in front of the Santa line. Maybe my astounding artwork or razor wit from the joke barrel I had sent them paid off. About any local kid function the duo would appear— the Heart of Illinois fair, McDonald's opening or charitable fundraising such as hosting your own carnival for fighting muscular dystrophy. Chicago had Ray Raynor but we had Captain Jinks! Also the long arm of matey, Cookie, who the audience only saw an outstreched arm. Captain Jinx, Salty Sam and some young fans at an outside event in Peoria. The show took a break in the 70's but returned until 1981 when kids shows were starting to be passe' and advertising dollars could be better reaped by talk shows. Salty Sam, George Baselean, hosted at a local restaurant, the Heritage House, for many years. 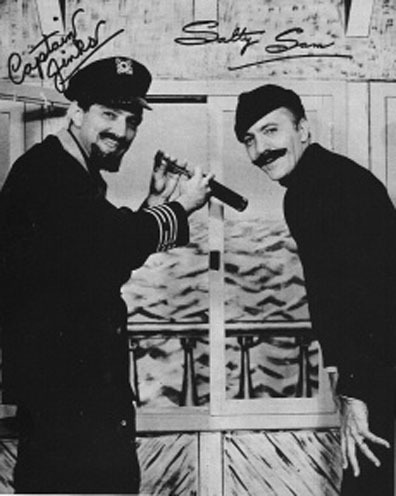 Captain Jinks, Stan Lonergan, still did voiceover work for channel 25. I have a sketch of Jinks and Salty at the counter of Acme Comics. Almost daily we get comments of people fondly remembering the two. Even more surprising that many people in their 20's know Jinks and Salty, hearing stories from parents and grandparents. A marker is located at Springdale Cemetary commemorating the pair who passed away over 20 years ago. Yes, like gateway drugs, my Captain Jinks addiction turned me to harder pop culture addictions—Monty Python, National Lampoon, Ralph Bakshi cartoons, record collecting and for that I am grateful. All images courtesy of the Captain Jinks and Salty Sam Facebook group. If you didn’t have the pleasure of growing up in Peoria and watching the Captain Jinx show, you can now see what you missed. WEEK has a limited edtion DVD of a TV special about the show that also includes 60 minutes of lost footage of the Captain and Salty. Click here to order. 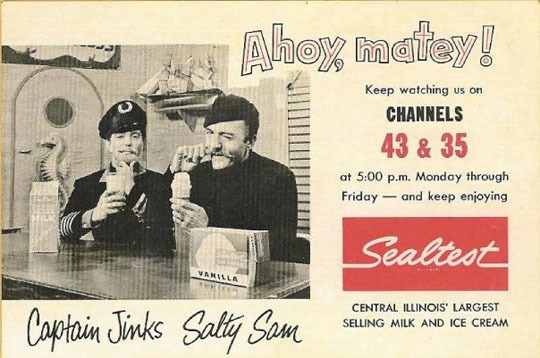 And check out Captain Jinks and Salty Sam collectibles at Cafe Press. Further Reading Peoria Journal Star, Facecrack and House of Jitters. I’m your Captain, yeah yeah yeah yeah. Bonus New York Photos by Bobby Williams! Bobby Williams takes photos for EV Grieve, but he shot some in Washington Square Park recently and that’s out of EV Grieve’s boundaries, so he sent them to me. Here’s a little slice of New York and a hawk that inhabits Washington Square Park. Thanks Bobby, great photos! If you live in or around New York City, you should check out the Holiday Hand-Made Gifts and Crafts Fair this weekend that MBIP commenter, Spike and his wife, Sacha put together at d.b.a. every year. It's a lot of fun and there's tons of cool handmade items for that special someone on your Christmas list. 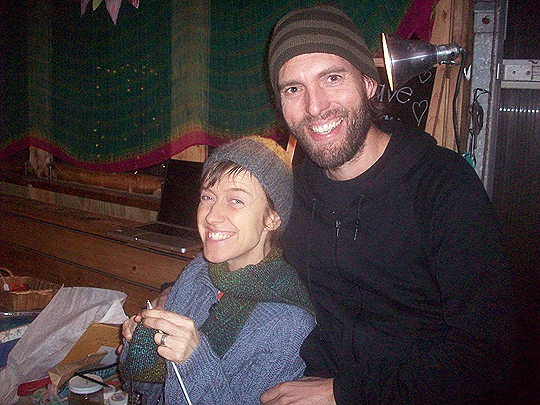 Sacha and Spike at last year's Craft Fair. Stop by and say hi to them if you're in the area.